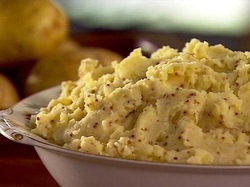 Make Mashed potato: Place potato in a large saucepan. Cover with cold water. Bring to the boil over high heat. Cook for 8 to 10 minutes or until tender. Drain. Return to pan over low heat. Toss for 1 minute or until excess liquid has evaporated. Remove from heat. Add milk and butter. Using a potato masher, mash until smooth. Season. Heat a medium non-stick frying pan over medium heat. Add bacon. Cook for 3 to 4 minutes or until crisp. Transfer to a plate lined with paper towel to drain. 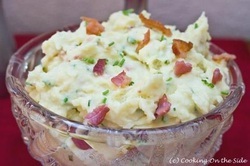 Place mashed potato, egg yolk, onion, bacon and 1/4 cup flour in a bowl. Mix to combine. Shape heaped tablespoons of mixture into 20 balls. Push a cube of cheese into centre of each ball, shape mixture around cheese to enclose. Place remaining flour on a large plate. Place breadcrumbs on another large plate. Whisk egg and milk together in a shallow bowl. Roll croquettes in flour, shaking off excess. Dip in egg mixture. Coat in breadcrumbs. Pour enough oil into a medium, deep frying pan to come 5mm up side of pan. Heat over medium-high heat. 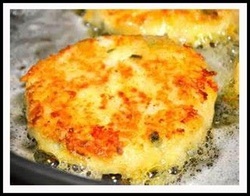 Cook croquettes, in batches, turning for 3 to 4 minutes or until golden. Using a slotted spoon, transfer to a plate lined with paper towel. Serve croquettes with salad leaves and sauce. Heat broth and potatoes in a 3-quart saucepan over medium-high heat to a boil. Mash potatoes with ¼ cup broth, cream, butter and black pepper. Stir in sour cream, bacon (reserve some for garnish) and chives. Preheat the oven to 220*C.
Cut off the butter, the onion, and also a little bit of bacon into thin slices and add them between the slices of the potatoes. If you prefer, you could also add a bit more olive oil. Bake for 45 minutes, then cover with aluminum foil and bake for another interval of 15 to 30 minutes, or until potatoes are cooked. Top with cheese or your favorite toppings. Wash your potatoes and then poke at the skin with a fork to allow steam to escape. Bake potatoes in the oven for an hour at 350°F or 175°C. While the potatoes are cooking, cook up the 8 strips of bacon in a pan. When they’re cooked, drain them and let them cool on a paper towel. Now break them up into small pieces with your hands and set aside. When the potatoes are fully cooked, take them out and slice them in half lengthwise. Now scoop out the potato flesh into a bowl. If the potatoes have been fully cooked, this should be easy. Don’t worry too much about getting all the flesh out. If you do that you could easily rip the skin apart and we want it intact. Mix the potato flesh with the sour cream, milk, butter, salt, pepper, half of the cheese, and half of the green onions. In other words, set aside one half of the cheese and one half of the green onions and toss everything else in with the potato flesh and mix it up. When it’s all smooth and thoroughly mixed, spoon the mixture back into the potato skins. Put the potatoes back into the oven at 350°F/175°C for another 15 minutes. Microwave the potatoes on High for 12-15 mins until tender. Meanwhile, steam or boil the broccoli for 3 mins, then drain well. When the potatoes have cooled a little, cut them in half lengthways and scoop the insides into a bowl. Put the potato shells on a baking sheet. Mash the flesh with a fork, then stir in the mustard, egg, most of the cheese and the broccoli. Season if needed, then pile back into the shells. Sprinkle with the reserved cheese and bake for 15 mins until the tops are crisp and golden. Preheat oven to 375°F. 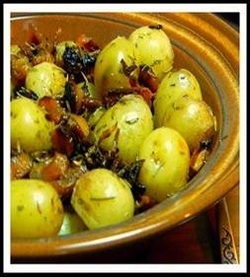 Rub potatoes with 1 Tbsp. oil; pierce with a knife. Bake until tender, 1 hour and 30 minutes. Steam broccoli until tender, 5 minutes. Drain; rinse. Pat dry and roughly chop. In a skillet over low heat, warm 1 Tbsp. oil. Sauté onion until soft, 10 minutes. Add garlic; cook 2 minutes. Remove from heat. Let potatoes rest until cool enough to handle. Set oven to 350°F. Cut top 1/4 inch off potato. Mash potato flesh. Mix with remaining ingredients. 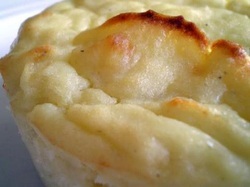 Fill potato shells with mixture; bake 30 minutes. Preheat the oven to 200C/Gas 6. Peel the potatoes and trim them into *barrel shapes. Leave the potatoes in a bowl of cold water. Melt the *butter in a frying pan. Add the onions, stir cover with a lid. Cook for 2-3 minutes, until they are soft but not brown. Chop the bacon and add to the onions, cover and cook for 2 minutes. Spoon the onion mixture into the base of a 1.5lt regular shallow oven proof dish. Lay the potatoes over the onion mixture and pour the stock over, making sure that it comes halfway up the sides of them. Season and cook for 1 hour. Garnish with chopped parsley. I use baby / small potatoes it works perfect. I do not use butter but saute/cook the onions in a bit of water as the bacon is fatty! I don't add salt as the bacon and onion mixture creates a beautiful flavour. Meanwhile put the spring onions into a saucepan with the milk. Drain the potatoes well and leave to cool. When they are cool enough to handle, peel and return to the saucepan. Put the pan on the heat and, using a wooden spoon, stir for 1 minute until the moisture has evaporated. Mash the potatoes with the milk and spring onions and season. Serve hot with a pool of melted butter in each portion. If you make too much mashed potato, don't worry. It keeps well in the fridge and simply need re-heating. In a large bowl, stir together the mashed potatoes, cheese, scallions, egg and 3 tablespoons flour until combined. Using your hands, divide the mixture into 12 portions. Roll each portion into a compact ball then flatten it into a pancake about 1,5cm thick. All leftover mashed potatoes will vary in consistency depending on how much cream, milk or melted butter you added to the original batch. If the mashed potato pancake mixture looks too dry and isn't holding together, add one more egg. If it looks too wet, add more flour, 1 tablespoon at a time, until the mixture is cohesive. Using a wooden spoon as a cradle, place each potato in the spoon and make several parallel slits into each potato top making sure not to slice completely through. Place 3 garlic slices between slits at the crown of each potato. Toss in a medium bowl with butter and olive oil. Place on a baking sheet lined with tin foil and sprinkle generously with salt and pepper. Once the potatoes and bacon are fully cooked (use a knife poke test), coat the potatoes with heaping helping of shredded cheese. .
Bake until tops are crispy and potatoes are cooked through, about 1 hour. Transfer to a platter and top with Herbed Sour Cream and chives. Preheat oven to 190 C. In a bowl combine butter and oil. Use part of the mixture to grease the bottom of a 9×13 or similar pan. Set remaining oil/butter mixture aside. Slice the potatoes very thinly. I do this in my food processor using the slicing blade, so that I have thin and even slices. Arrange potatoes tightly in the greased pan. Sprinkle with salt and drizzle remaining butter on top. 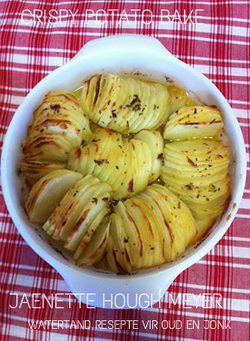 Bake for 1 hr and 30 minutes or until potatoes are crisp on the outside and tender in the middle. I usually check this at about 1 hr and 15 minutes and then cook about 15 minutes more, but the time may vary depending on the thickness of the potatoes. Additional fillings of y1our choice sautéed vegetables, bacon or ham, etc. Lightly grease with butter 8 - 9 of the wells of a nonstick muffin pan. In a medium mixing bowl whisk the eggs then mix in the sour cream. Stir in both cheeses and the chives. Add potatoes and mix well. Spoon them into the pan filling the cups to slightly below the top. Bake 25- 35 minutes until they pull away from the sides of the cup and are golden brown. You’d firstly better know that if you use an new potato, the ‘petals’ will be fragile enough. This is why you should use a late potato. 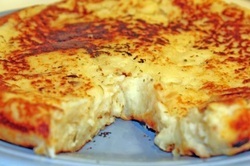 The potatoes are peeled, cut in slim slices (it is recommendable to use the cutting machine, set to the minimum size). The slices are put on a parchment, then you take them one by one and mold the roses. The “rose petals” should turn out thin and translucent. For the central “buds” cut 3-4 mm thickly slices. After this soak the petals, buds and toothpicks in a bowl with cold water and salt (1 liter of water, a spoon of salt) for 2-3 hours. This process will soften the petals and will make them more pliable when twisting the potato roses. Use the smallest toothpicks that you find. OK, now we will start to manufacture the roses. Take the central “bud” and wrap one petal. Then take another petal and twist it also on the central “bud”. Fix the bud with a toothpick. It is important to follow the rule: one petal – clockwise and following – counter-clockwise. After you form the potato roses put them on napkins for 3-5 minutes. Now, you can prepare the pot with the oil. Put the potato rose in the pot to fry. When “rose” will get crisp color – it is ready. Take it out on a paper napkin and slightly salt it. You can take out the toothpick when the potato rose is not so hot anymore. Enjoy!!! Cut potatoes into wedges, keeping the skin on. Drizzle with olive oil, tossing well to coat the wedges. Sprinkle with Robertsons Rosemary and Robertsons Garlic Flakes. Season with Robertsons Atlantic Sea Salt and Robertsons Black Pepper. Roast in at 180 °C until the potatoes are soft inside and crispy and crunchy on the outside (about 1 hour depending on the size of the potato). This is so easy. Are you ready? Start off by preheating your oven to 200 degrees C. While it’s heating up, chop the onion, apricots, and mince the garlic. Place all into a bowl with the baby potatoes and pecans. Add in your spices, a good sprinkling of sea salt, some olive oil, than toss until everything is evenly coated. Place into a mid-sized roast pan and cover with tin foil. Pop the pan into your oven and roast, covered, for 35 minutes. Heat the butter in a broad non-stick pan, add the cheese slices, milk and cream, mix well and cook on a medium flame for 1 to 2 minutes, while stirring continosuly. Add the mixed herbs, mix well and cook on a medium flame for another 1 minute, while stirring occasionally. Keep aside. Heat the butter in a broad non-stick pan, add the potatoes, salt and pepper, mix wel and cook on a medium flame for 2 to 3 minutes, while stirring occasionally. Keep aside. Heat a sizzler plate till it is red hot. Put the butter and the potatoes, mix gently and cook on a medium flame for 2 to 3 minutes, while stirring occasionally. These light and fluffy potato dumplings are named after the Italian word meaning ‘lumps’ and, when smothered in a delicious sauce, the soft little potato pillows become the ultimate comfort food! 1. Cook the potatoes in boiling salted water until tender. Drain and peel while still hot. Press the potatoes through a sieve into a bowl. 2. Stir in the egg and salt and pepper. Add ¹/³ of the flour and mix. Place the rest of the flour onto the working surface, turn the potato dough out and knead in enough flour until the dough no longer sticks to your hands. Add a little more flour if necessary. 3. Form the dough into long sausages and cut the gnocchi into 2cm pieces. 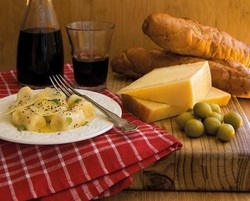 Roll them over a fork to create grooves or use a gnocchi paddle. 4. Bring a large pot of salted water to the boil and drop in the gnocchi. Remove them as soon they begin to float. Drain well and toss into your chosen sauce. To freeze gnocchi, spread on a floured baking tray and place them in the freezer. Once frozen, shake off excess flour and place in freezer bags. Gnocchi can be cooked from frozen. Frozen gnocchi keeps its shape better than fresh… so make a double batch when you’re in the mood and freeze half. Choose potatoes that are not too waxy. Replace a portion of the potato with cooked sweet potato, butternut, parsnip or carrot. Flavour the gnocchi mixture with chopped herbs, spices or even cheese. Did you know? Very small gnocchi are actually called gnocchetti. You can easily scale up this recipe. To make ahead for a dinner party, just prepare the mashed potatoes, pipe them and refrigerate. Put them in a 425°F oven 20 minutes before serving to brown. 1 Place potatoes in a medium to large pot (3 qt) and cover with a couple inches of cold water. Add a couple teaspoons of salt to the water. Bring to a simmer and cook until the potatoes are tender (the tines of a fork easily pierce), about 20-25 minutes. 2 While the potatoes are boiling, melt 2 tablespoons of butter and set aside. You will use this butter to coat the potatoes right before they go in the oven. Preheat the oven to 425°. 3 When the potatoes are cooked, drain in a colander and put the potatoes back in the pot set over low heat. Allow them to release steam for a minute or so. Add 2 tablespoons of butter and mash the potatoes until the butter has been incorporated. Add the nutmeg, black pepper, heavy cream and continue mashing the potatoes. Once everything is incorporated, add salt to taste and the egg yolks. Continue to mash until the mixture is smooth. Do not over-mash or your potatoes will end up with a gluey consistency. 4 Using a piping bag with a large star point, pipe the potatoes onto a cookie sheet. Alternatively, you can just fill a casserole dish with the mashed potatoes, and use a fork to create lots of peaks on the surface. The swirled edges from the star-point piping bag forms or the peaks of mashed potatoes in a casserole dish will brown nicely in the oven. The browned parts taste great, so you want to maximize them. Whether you make piped portions or a casserole, paint the potatoes with the melted butter. Bake in the 425°F oven until nicely browned, about 20 minutes. Yield: Serves 4-6 as a side dish. Mash potatoes with ¼ cup broth, cream, butter and black pepper. Stir in sour cream, bacon (reserve some for garnish) and chives. Sprinkle with remaining bacon. Preheat oven to 350 degrees. 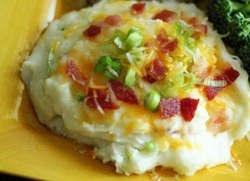 In a large bowl, combine mashed potatoes, sour cream, ranch dressing mix, 1 cup cheese, bacon and onions. Spread into large casserole dish. Bake for 25 minutes or until heated. 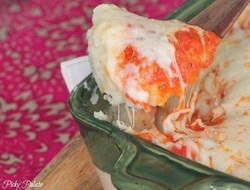 Remove from oven and sprinkle top with remaining 1 cup of cheese. Fill a large saucepan about halfway, with warm water. Bring to a simmer. Peel and slice potatoes, and add them to the simmering water. Add a few pinches of salt, increase the heat, and bring to a boil. Check the potatoes with a knife. If the knife has some resistance, continue simmering the potatoes until the knife comfortably slides through the potatoes. When the potatoes have cooked through about 15 minutes, drain them in a large colander. Add them back to the saucepan. To the saucepan, add the milk and butter, followed by a the nutmeg. Mash potatoes until smooth. Stir in Dijon mustard. Season with more salt and pepper, to taste. 1. Preheat oven to 350 degrees F/180*C. and lightly spray 9×13 inch baking dish with cooking spray. 2. Boil cubed potatoes for 10-15 minutes until fork tender. Drain and transfer to a large mixing bowl. Using a hand mixer or stand mixer beat potatoes on low until they come together. Add salt, garlic salt, pepper and milk until potatoes and nice and whipped. Only beat until combined. 1. Boil the potatoes well. Boil the crap out of them. Drain and return to the burner. Continue to cook the potatoes over low heat for about 5 more minutes (stir so they don't stick) this will get all the extra water out of the potatoes. 2. Mash the potatoes very well. We want NO LUMPS. I put the potatoes through a potato ricer which takes care of that nicely. 3. In another bowl, with a hand mixer, beat the eggs, butter and cottage cheese until fluffy. Add in the potatoes and onions and beat with hand mixer until all mixed together. 4. Put the mixture into a greased casserole dish, or muffin tins. This is where you can let it cool and refridgerate, if you are making them ahead (let them come back to room temperature before baking though). 5. Bake in a 450°F oven for about 25 minutes (a little more if you are making them in a big casserole dish). The potatoes should puff up and get a little brown on top. In an electric skillet, heat 1 inch of oil to 375°. 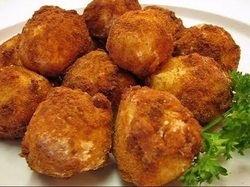 Fry potato balls, a few at a time, for 2-1/2 to 3 minutes or until golden brown. Remove with a slotted spoon to paper towels to drain. Serve warm. Yield: 6 servings. Take potatoes out of the fridge and let sit for a few minutes to take the chill off a bit. Meanwhile shred the cheese, chop scallions, and cook bacon then dice finely. Add potatoes and flour to a large mixing bowl and stir to combine well, then add cheese, bacon, and scallions. Take about a heaping tablespoon of mixture and roll with hands into a small ball. It if doesn’t hold its shape, add a little more flour to make the potatoes sturdy. Repeat until done. Whisk egg into a small bowl and season with salt and pepper. Place bread crumbs in an additional bowl. Dip each ball in egg and then roll in bread crumbs until fully coated. Set aside on a sheet pan. Test oil with one ball. The oil should bubble when potato is in oil and ball should take about 1-2 minutes to brown and cook through. (If takes longer the oil needs to be hotter, if it browned too quickly on the outside and the inside is still cold, the temperature needs to be lower.) Once oil is ready, add potato balls in small batches and fry for 1-2 minutes – it will depend on size. Remove with slotted spoon and place on paper lined plate to allow excess oil to drain off. Repeat until done. Allow to cool for a minute or two and serve with dipping sauce. Just mash potatoes plain with butter or you can add yummy ingredients like cooked bacon, cheese, parsley, green onion, garlic, etc. Stuff in to a greased muffin tin, run a fork along the top and brush with melted butter or olive oil. Bake at 190 C - 375 F or until tops are crispy and golden. First step is to mix all of your ingredients together except for the olive oil and butter and Dredging materials. Form your potato mix into patties of whatever size you like. I used about 1/3 cup per patty and made sure it wasn’t too thick. Then coat each patty in the flour and seasoning mixture. I pan fried these for about 3 minutes on each side or until a golden crust was formed! I served them with a bit of ranch Sour Cream with chives in it, but these would be good alone or with almost any kind of delicious sauce! YUM! I also think these would be good as a side dish with some grilled chicken and a gorgonzola cream sauce with some Fired broccoli! YUM!!! 2.Combine potatoes, Italian seasoning, garlic powder, french fried onions and egg; mix well. In a skillet, heat oil over medium-high heat. Add potato mixture; press with a spatula to flatten evenly. Cook for about 7-9 minutes or until the bottom is crispy. 3.Spray a large plate with cooking spray and place over skillet. Carefully flip so that the potato cake is on the plate. Slide back onto skillet, non crispy side down. (Don’t worry if some potato is left on the plate.) Allow to cook until both sides are crispy. 4.Slide on to serving plate and allow to cool for a few minutes before serving. This makes enough for about 8 people as a side. Just divide the ingredients in half for a smaller crowd. In a small sauce pan, melt butter and blend in flour. Let sit for a minute. Add all of cold milk, stirring with a whisk. Season with salt and cayenne. Cook sauce on low until smooth and boiling, stirring occasionally with a whisk. Reduce heat and stir in cheese. Repeat with second layer of potatoes and cheese sauce. Sprinkle the remaining cheese on top. Top with some paprika for color. Bake uncovered for about 1 hour at 350°F. 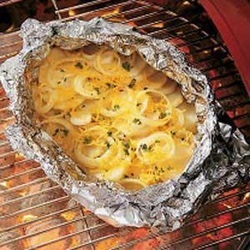 • Place the potatoes and onion on a large piece of heavy-duty foil (about 20 in. x 20 in. ); dot with butter. 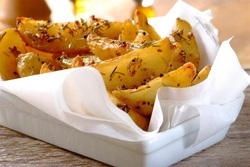 Combine the cheese, parsley, Worcestershire sauce, salt and pepper; sprinkle over potatoes. • Fold foil up around potatoes and add broth. Seal the edges of foil well. Grill, covered, over medium heat for 35-40 minutes or until potatoes are tender. Yield: 4-6 servings. Nutritional Facts 1 serving (1 cup) equals 276 calories, 13 g fat (8 g saturated fat), 37 mg cholesterol, 245 mg sodium, 35 g carbohydrate, 3 g fiber, 6 g protein.